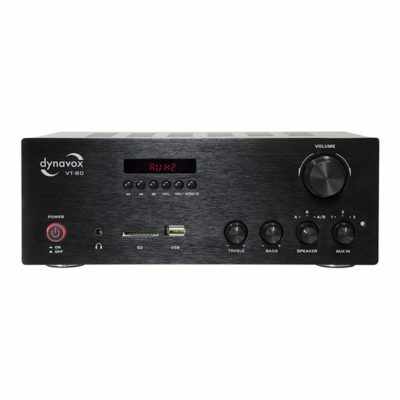 The Dynavox VT-80 is a high-quality processed stereo compact amplifier for connecting two analog input sources (RCA), as well as for digital input signals (SD, USB and BT). With the VT-80 you have the possibility to connect 2 pairs of speakers, which can either be switched in pairs or operated at the same time. This makes it ideal for the sound of a second room, a terrace, etc. 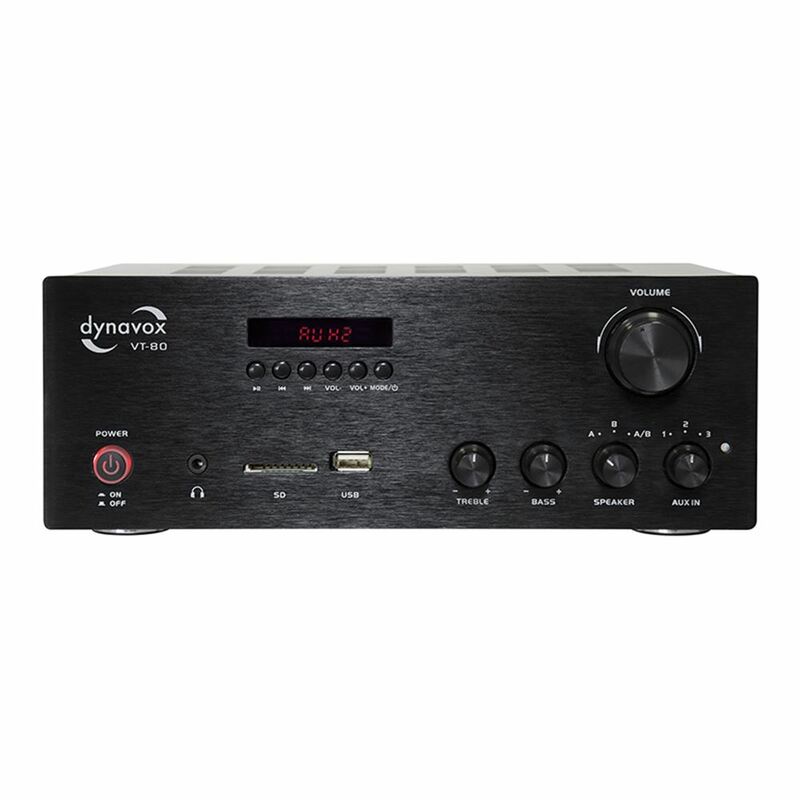 In addition, the VT-80 has a regulated, pre-amplified signal output (Pre-Out) to operate another power amplifier or an active subwoofer, a 2-band Sound control and via a remote control, to control the digital signal inputs. 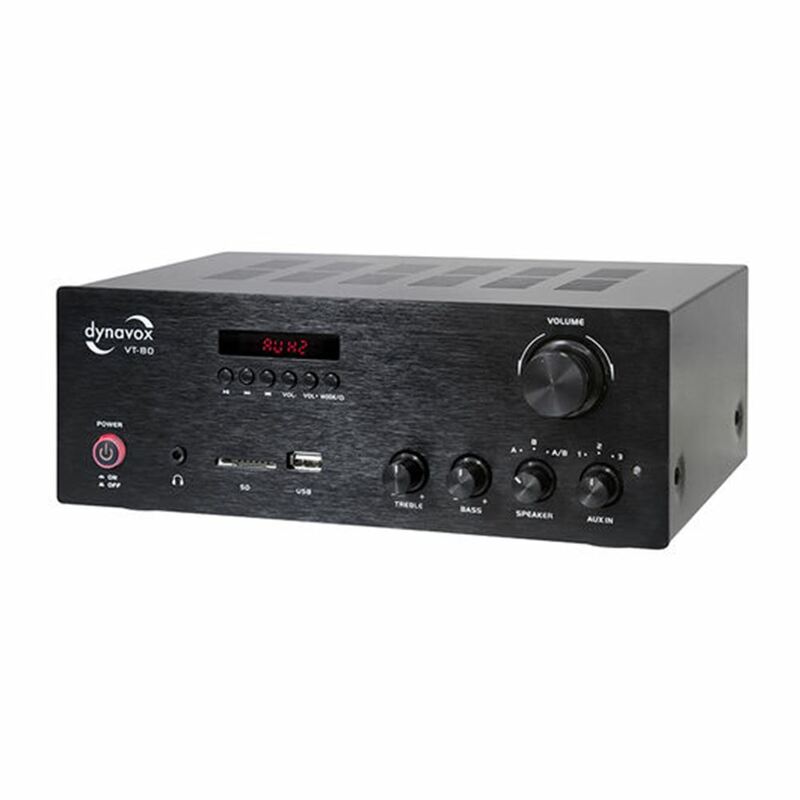 The small device dimensions make the VT-80 a space-saving amplifier for a small to medium-sized stereo system. Specifications: Frequency response: 20 Hz – 20 kHz (+/- 3 dB), Rated output power (music / 4 ohms): 160 W, impedance: 4 – 8 ohms, input sensitivity: 220 mV (1 kHz, THD 1%), distortion: 0.3% (1 kHz, 1 W), signal-to-noise ratio: 83 dB, inputs: 2x stereo RCA connector, SD, USB and BT, supported formats (USB / SD): MP3, WAV and WMA, outputs: Pre-out (stereo RCA), banana screw terminals for 4 speakers, 3.5 mm Headphone jack, mains connection: 230 V / AC, 50Hz, dimensions (L x W x H): 250 x 180 x 95 mm, weight: 2.9 kg, color: black. For simultaneous operation of all 4 speaker connections, speaker boxes with an impedance between 8 – 16 ohms are required! 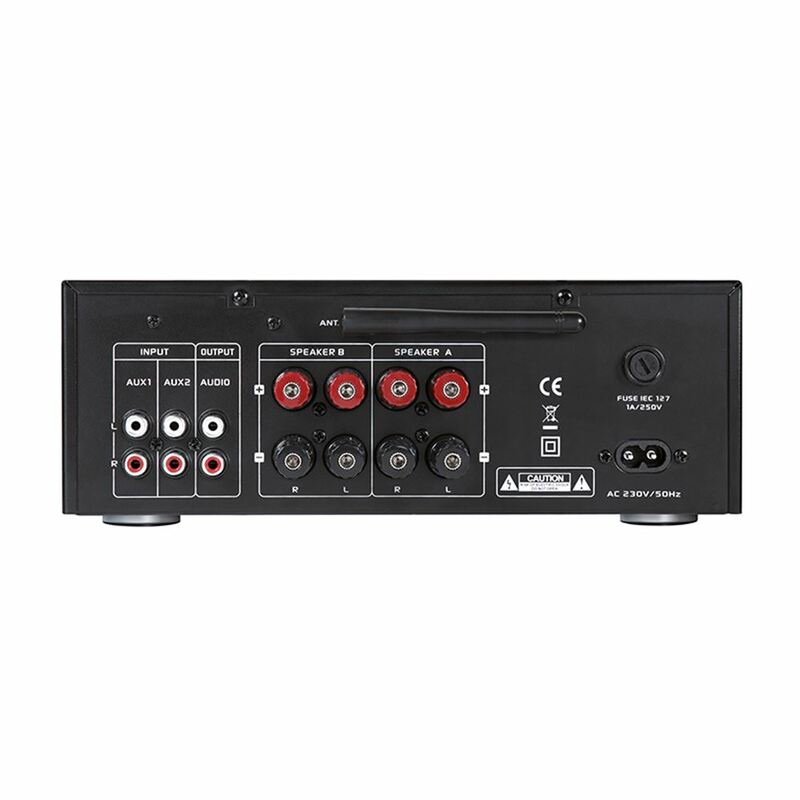 2x stereo cinch socket, SD, USB and BT, supported formats (USB / SD): MP3, WAV and WMA, outputs: Pre-out (stereo RCA), banana screw terminals for 4 speakers, 3.5mm headphone jack , Mains connection: 230 V / AC, 50Hz, dimensions (L x W x H): 250 x 180 x 95 mm, weight: 2.9 kg, color: black. For simultaneous operation of all 4 speaker connections, speaker boxes with an impedance between 8 – 16 ohms are required! 2x stereo cinch socket, SD, USB and BT, supported formats (USB / SD): MP3, WAV and WMA, outputs: Pre-out (stereo RCA), banana screw terminals for 4 speakers, 3.5mm headphone jack , Mains connection: 230 V / AC, 50Hz, dimensions (L x W x H): 250 x 180 x 95 mm, weight: 2.9 kg, color: black. 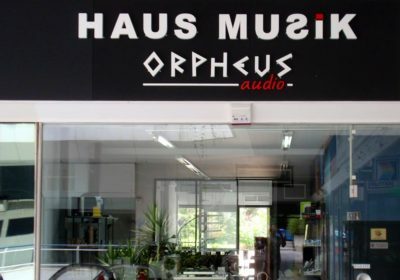 For simultaneous operation of all 4 speaker connections, speaker boxes with an impedance between 8 – 16 ohms are required!